Referrals – referrals are key to the continuing success of a business. Because you would have put a lot of effort into getting yourself a nice little client or another client, or a few clients. And when those clients have done their, worked with you and they finish contracts and they move on, whatever, wouldn’t it be helpful if you didn’t have to go back to the board, drawing board, and start all over again, and try and get a whole lot of new ones with all the effort on your part. A kind of feast and famine, lots of clients, end of clients. Go get some more, lots of clients, end of clients, go get some more. Has that ever happened to you? 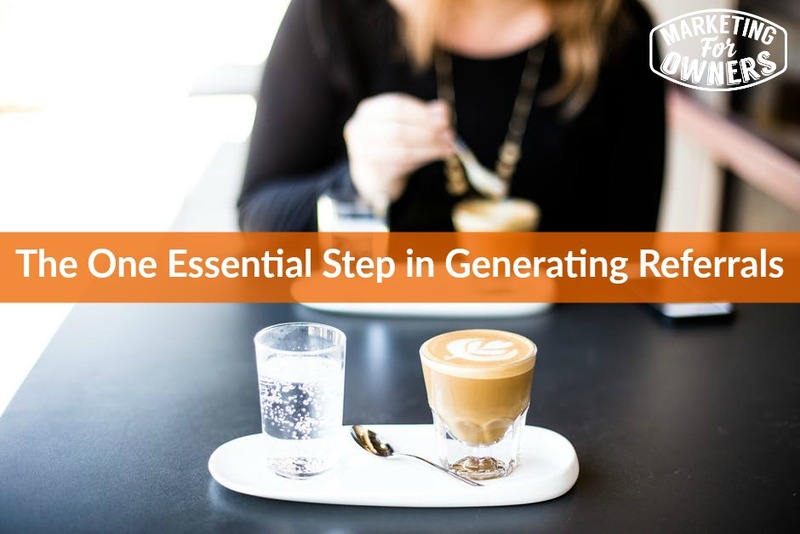 So, okay, we’ve got the gist of that, Jon, and this is by the way, this is the part, this is step six of the the seven steps of modern marketing system. It is where they become preachers. Other people refer to them as evangelists and advocates and whatever. It doesn’t matter. The best example is Apple. People who have Apple gadgets, iPhones etc., Macs, they will tell everyone else they need to get one, because they love them. Apple doesn’t have to, they do advertise because they’ve got more money than anyone and they have to spend it on something. But they don’t really have to as much as anyone else because they know when a new product comes out, everyone’s going to want one, and everyone’s going to tell their friends, ‘Oh, the new Apple product is coming out.’ Imagine having something like that for yours – for you. It’s not going to be quite Apple style but the same sort of theory where the people who buy from you are the ones who refer you and get you new clients. Okay. ‘So, okay Jon, get to the point.’ What is this one trait? Yes, if you are listening, for a long, long time, you’ll have heard me say this bit before because it is so key, it is so important that I’ve to repeat it. If you’ve done this for yourself, then it’s time to review. Are you as good, are you as referable as you could be? Are you? Don’t get complacent. Don’t assume once you did it, it’s all done. If you haven’t got around to this, it’s time to get started. Because otherwise it’s not going to happen. And then you’ll get like one or two put the hand up because all, everyone else, everyone thinks they get word of mouth because they don’t track advertising. So, you’ve no idea, so you just assume people are telling it. But referrals is a system, okay. So, you’ve to make yourself referable, and how do we do that? This is so simple. There are four steps. How about that? How simple is that? Let me put into context. I’m going to give plumbers a rest for a minute. I run a fire-safety business. So, we service fire extinguishers amongst other things. And I owned a large fire-safety business in the past where we maintained fire extinguishers, fire systems, fire-alarm systems, and so I have employed service engineers, service technicians. And what we’re doing is generally or in the old days anyway, the beginning of the month, so at the beginning of April, we will give, we would allocate all of April’s work and we would give them all of April’s work. The engineer knows where he’s going to be; he can decide when he’s going to service them during that month, in what order, how many a day and how he’s going to organize it. Now some will have the experience of visiting those customers before and they will know, perhaps one is a shop and they could just turn up. Others they’ll know, they need to phone in advance and so on. But some of those that get phoned in advance and say I’m going to be there on a Monday afternoon. Other stuff comes up. The job…the two jobs before, they run over and they don’t make it Monday afternoon. They think I’ll call them, rearrange it. Quite often, they did not tell the customer that they weren’t coming. They didn’t just pick up the phone and say, ‘Sorry, I don’t think I’m going to make it,’ or ‘Sorry, I’m stuck on a job, if you had to do something, if you were waiting in, you’ve probably got an hour and a half extra, so if you’ve got to do, go out and do that, then come back, and I’ll be there. If you’re not back in time, I’ll wait. Very sorry, etc.’ that just didn’t happen, and it took a long, long time for me to convince people to do it. And generally, they didn’t. One of the reasons I sold my business. It’s because we weren’t, we didn’t have the culture in our company where they wanted to do it, they had no reason. Now, you may have any kind of business. I’m only going to refer to them where you’ve got staff that go out and about because you probably think this is out of your control. You’ve probably got somebody who’s difficult, who you’ve tried to do that, you’ve tried to get them phone up customers or be helpful for customers, or do this and they just don’t. They say they will, they just don’t. Because what difference does it make? They are getting paid anyway. But this affects you. They’re going to get paid whether they do it or not. So, it’s an effort for them, so why should they? Because there is no reason. Now this goes back to your ‘why’ and to the start of this and I’ve said it before where we get the buy-in, the buy-in from the staff as to why they are working for you, there is a whole new thing. Well, here’s a thing, in my experience, and remember, I’ve been doing this and various things for 30 odd years; in my experience, when you are obviously ‘let someone go,’ unfortunate as it may be, and one trick there by the way, don’t employ friends because when you’ve to let them go, not nice. But when you let them go, the next person you get, you start them with all that information. You will replace them with someone better. You think they are the best person ever, they are not. There are others. There are seven billion people on this planet, there are millions in your country. There are others who can do that job. This is not the world’s best whatever. You’ll be able to replace them and when they start, you say, ‘By the way, one of our conditions, we expect you to call customers and let them…keep them informed. We expect you to be presentable. We expect you to say please and thank you.’ And all these kind of things. So, you build it into the culture, the expectations and you give them the ‘why’ but you get people to do this, it becomes a norm. Don’t tell them though, explain ‘why’. Explain why, explain how this works. Oh! Call customers afterwards, ask them how, how they thought…did they do this, did they do that, did they say please and thank you? If they didn’t, go back and explain that it needs to be improved. But that single, one thing. Make yourself referable. In that way, there are others. Tidy up your reception area, tidy up your shop. Get a new sign on the front. Get new uniforms. Replace staff uniforms when they get tatty. Yes, it costs a few pounds. No, it wasn’t your fault. Yes, they are using the wrong washing powder. You can afford a new polo shirt. All these things. Make yourself referable, make your business referable. Okay. It is Thursday. It’s time for a drive-time podcast, and today, we have ‘Learning with Leslie’. Now this is all about general stuff, blogging, online business, you know, entrepreneurship. It’s Leslie Samuels. I’m not going to say any more than that but it’s very popular. He is great, he really is. Just look it up, Google it, just Google it. 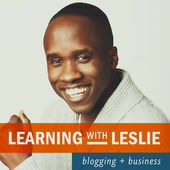 Honestly, ‘Learning with Leslie’ podcast. Just Google that or go onto iTunes, ‘Learning with Leslie’. You’ll find it. It is wonderful. And tomorrow, Friday, is our ‘Ones to Watch’ and we have a lovely boy. I really got on with this guy. Phil — he’s great and he has some great advice that will work for you. Well worth a listen. Enjoy.